Start by making your roast beef sandwich on sliced whole-wheat bread, a whole-grain tortilla or a whole-wheat roll. Whole-grain breads are naturally higher in dietary fiber, magnesium and iron than white breads. Then choose lean cuts of roast beef to keep your saturated fat in check. A 3-ounce portion of roasted beef chuck contains 4.4 grams of saturated fat, while a 3-ounce portion of roasted bottom round contains only 1.9 grams of saturated fat. Lastly, add any number of nutritious options to give your sandwich a tasty, healthy kick. Vegetables are low-calorie additions that add nutrients such as dietary fiber, potassium, and vitamins A and C. If you are packing a sack lunch and making your roast beef sandwich ahead of time, add lettuce and tomatoes to your sandwich. Put roasted red peppers, sun-dried tomatoes and fresh basil on your sandwich to give it an Italian flare, or make your sandwich spicy with grilled Anaheim chilis and jalapenos. Freshly grilled onions and mushrooms are other toppings for toasted roast beef sandwiches. Cheese provides additional protein and also is a source of calcium, which helps your body build and maintain bone mass. Choose low-fat cheese to limit your consumption of sodium, a mineral that in large quantities can cause high blood pressure and an increased risk for heart disease, stroke and kidney disease. Add low-fat provolone or mozzarella cheese to a roast beef sandwich with red peppers; make roast beef and mushroom sandwiches with Swiss cheese; or add low-fat cheddar cheese to a roast beef sandwich with onions, green peppers and tomato sauce. Avoid butter because of its high content of saturated fat, which raises levels of cholesterol in your blood and can increase your risk for heart disease. Instead, add avocados or guacamole to reduce the dryness of your roast beef sandwich since they contain heart-healthy fats. Vinaigrette made with olive oil and vinegar -- and hummus made with chickpeas, olive oil and tahini -- are also sources of unsaturated fats. 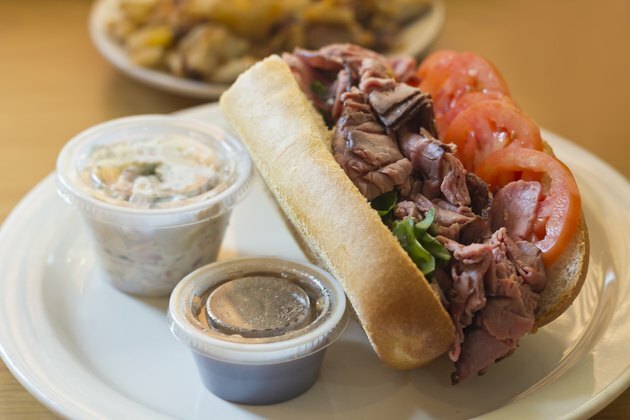 Low-calorie condiments can add flavor to your roast beef sandwich. Some ideas include yellow, Dijon or spicy brown mustard; balsamic or red wine vinegar; or, for a Southwest flavor, salsa. Low-sodium soy or teriyaki sauce, along with ginger and garlic, provide an Asian flavor for your roast beef sandwich. Experiment with fresh or dried herbs, such as basil leaves or thyme, oregano or rosemary, to give your sandwich more flavor without adding salt.